<?xml:namespace prefix = st1 ns = "urn:schemas-microsoft-com:office:smarttags" />America has been built on a system of credit. For better or worse, it�s the only way in which the vast majority of Americans can make big ticket purchases and obtain what they need to get themselves started in life. Buying a home, getting a car, purchasing furniture, maintaining utilities and services � all of these things can or will depend on credit to be obtained. This is a very powerful system which enables people to acquire what they need quickly without finding themselves stuck and unable to proceed with modern living. The opportunity to obtain goods before paying for them in full is very intoxicating however, and often leads to living beyond ones means to make displays of success. Eventually for some, credit becomes less of a tool and more of a means of getting what they need to make themselves look like they�re better off than they actually are. That sort of behavior is very dangerous when it comes to personal finances, because it can only lead to severe debt. Even for individuals who make a considerable amount of money � around $60k or more � they�re susceptible to the effort of �keeping up with the Joneses�, so to speak, which puts them beneath what they can actually afford. For every raise comes an even more expensive home or piece of property that represents the accumulation of material goods as a sign of wealth. If you were a little, say, heavy-handed with the plastic this past holiday season in 2007, you may find yourself regretting that behavior when the bills roll in. Why? Banks and credit-card companies must follow new federal guidelines from the Office of the Controller of the Currency that require minimum payments to cover interest and fees plus at least 1% of the principal. For the 7% of consumers who pay only the minimum, that will mean writing fatter checks. But what if you're sick of the whole plastic ride and really want to put a serious dent in your debt? Here's how to get started. When you think about how you got into this mess, chances are it's a result of spending a little too much for a little too long. My book Pay It Down, now out in paperback, contains a step-by-step plan based on the idea that digging out of debt means reversing the process. So think about expenditures that you can trim. The faster you want it to happen, the bigger the cuts you have to make. While eliminating a daily latte will do a bit of good, you'll do better to focus on the dramatic. Do you really need that third car, for example? What if you cut back to basic cable or a bare-bones cell-phone plan, or (if you can't do that) got rid of your landline entirely? Perhaps this summer you could vacation at home instead of spending $2,000 for a week at the beach, or trade two weeks for a seven-day getaway. In recent years about a third of all mortgages issued have been adjustable. That's the highest percentage since 1990, when the Mortgage Bankers Association began tracking such numbers. When rates adjust, says Keith Gumbinger, vice president of HSH Associates, a publisher of mortgage-rate information, you could find yourself looking at an interest rate of 7%. Bring down the rate by locking into a 30-year fixed-rate mortgage at today's 6.3%. On a $275,000 mortgage, you'll save $128 a month, or $1,526 a year. More than two-thirds of Americans received a tax refund last year, and that return averaged $2,200. To get your refund back as quickly as possible, consider filing your taxes electronically, and then elect to have the refund deposited directly into your account. You'll have your money in 10 days to two weeks rather than six to eight weeks if you file by snail mail. Once you've made those sacrifices, be sure to make them stick. How? Use a debit card rather than a credit card, so that you're spending money you have, not money you don't. And start keeping track of where your money is going so that you can stop yourself from overspending in 2009.
Credit Cards - Do we REALLY Need Them? Owning your home is part of the American Dream, but if you�re not prepared, buying it can be a nightmare. Here are some fundamentals for buyers and sellers. Debt is a major problem for a lot of people these days. The problem is, even if they know they want to get out of it, they have a hard time figuring out how to start. If you fit this description, this 12-Step program spells it out for you. Now, there isn�t one way to get out of debt, and the best program should be tailored to each person�s individual situation. But if you feel like you just don�t know how to begin, this program is designed to give you a sort of guide � one that should be adjusted to fit your financial situation. It�s aimed not at people who have their finances together and are just trying to pay off a credit card or two. It�s aimed at those who have trouble finding any extra money to pay off debts, who seem to find themselves getting deeper and deeper into debt, and don�t know how to stop it. In other words, it�s a bit of an emergency program. Disclaimer: I�m not a financial advisor, and if you are in need of one, I suggest you find a qualified advisor. My only qualification is that I�ve made great strides in getting my finances under control, in starting an emergency fund, in paying all my bills on time, in not getting further into debt, and in eliminating my debt (I should be done by the end of this year). This program is based on my experiences, and on the large number of books and websites I�ve read. Acknowledge the problem. The first step is admitting you have a problem. The first week, all you have to do is say to yourself, �I have a problem with debt. I got into this because I spend money I don�t have. But I believe that there�s a way out, and I can do this. I can control my spending, make a plan, and slowly get out of debt.� That�s a major step. Now set aside just 30-60 minutes a week to deal with your finances � make it a set day and time, and don�t let yourself miss this appointment. Stop digging. If you�re in a hole, the first step is to stop digging, and that�s what you�re going to do this second week. For 30 days, see if you can stop any non-essential spending. If you have a major problem with credit cards, cut them up. If you�re not so bad with credit cards, at least put them away and don�t buy stuff online for one month. What�s essential? Obviously your bills, housing, auto, gas, groceries � that kind of stuff. Non-essential? Clothing, CDs, DVDs, books, magazines, gadgets � you know what I mean. Just 30 days. After that, you can decide how much to spend on these things. Start an emergency fund. This fourth week, set up a savings account, if you don�t have one already, for an emergency fund. Now take the amount you saved in Step 3 (and even in Step 2 if you think you can make them last for awhile) and set up a regular automatic deposit from your checking to this emergency fund savings account for this amount. It�s important that before you start paying off debt, you have at least a small emergency fund. Aim for $1,000 at first, and you can grow that later. The reason: if unexpected expenses come up, and you don�t have an emergency fund, you will skip your debt payments to pay for the unexpected expenses. The emergency fund protects your debt payments. Take inventory. OK, this is a step that we don�t like to take. But take a deep breath. You need to do this. Remember what you said in Step 1? You can do this. This fifth week, set up a simple spreadsheet. In one column, list all of your debts � credit cards, medical bills, auto loan, etc. You can leave out your mortgage, but put everything else. In the second column, put the amounts you owe for each debt. In the third, put the minimum monthly payment, and put the percentage interest in the fourth column. Total up the second and third columns to see your total debt owed and how much you have to pay, at a minimum, towards debt each month. Make a spending plan. 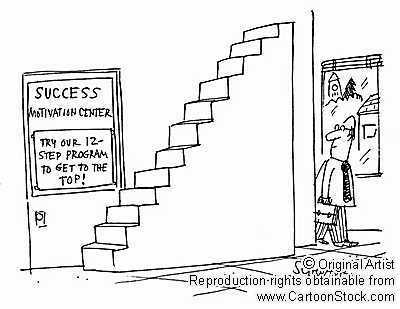 We don�t like to do this step either. But it�s not going to be as painful as we think. This sixth week, set up another simple spreadsheet. In one column, list your monthly bills (rent or mortgage, auto payment, utilities, cable, etc.) � everything that is a regular monthly expense. Then list variable expenses (things that change every month) like groceries, gas, eating out, etc. Later you should add irregular expenses (stuff that comes up once in awhile � less than once a month) such as auto and house maintenance, clothing, insurance, etc. But we won�t get into that now, as we want to keep it simple. In the second column, put down the amounts for each. Be sure to put enough for things like gas and groceries, as you don�t want to be short. Be sure to also include your minimum debt payments and your emergency fund deposit. Now, list your income sources and monthly amounts. There. You�ve got a temporary spending plan (you�ll want to add the irregular expenses later). Now, if the expenses are greater than the income, you�ll need to make adjustments until the expenses are equal to or less than the income. Control spending. If you�re into your seventh week of this debt plan, you may find it hard to keep track of your spending and ensure that you�re sticking to your spending plan. Here�s the key: first do the emergency fund deposit. Then do the debt payments. Then do your monthly bills. Then withdraw the variable amounts in cash, and put them into separate envelopes. It�s old-fashioned, but it works, as you don�t have to worry about overspending. When your envelope is empty, you can�t spend anymore. Continue to cut back on non-essential spending as much as you can at this point, so you�re able to stick within your spending plan. Pay bills on time. This may be a problem for a lot of people. It�s important, if you want to get out of debt, to start paying all your bills on time. If you follow the payment plan outlined in Step 7, your bills should be paid before you get to any discretionary spending categories. At this point, you want to focus on getting those bills paid on time, and making it a habit. If you have trouble remembering, try one of these methods: 1) pay bills as soon as they come in � take them to the computer and pay them online, or write out a check and prepare the envelope to be mailed the next day; or 2) set up a reminder in your calendar program to tell you when bills are due. Start a snowball. Now that your finances are relatively under control, you can start a debt snowball. At this point, you should have the beginnings of an emergency fund, you should know how much you owe, you should have a temporary spending plan, you should be paying bills on time and controlling your spending. Now you can focus on paying your debt. Here�s what to do: If you can find at least $100 from your spending plan, use that to start your debt snowball. 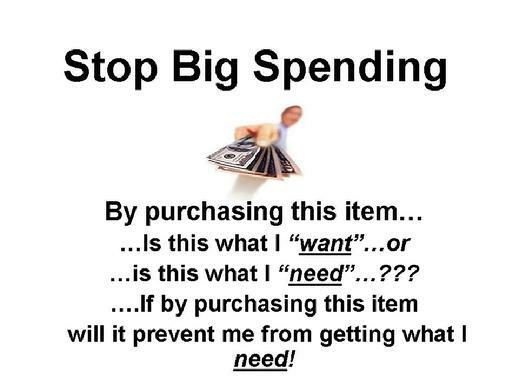 You may need to cut back on discretionary spending (as you did in Steps 2 and 3). Or, once your emergency fund is at $1,000, you can use the amount you were putting into that account for your debt snowball. If you have trouble finding $100 for a debt snowball, you need to look at what other expenses you can cut back on. OK, once you�ve found at least $100 for your debt snowball (and more would be better), take a look at your debt spreadsheet. First, order the debts from the smallest amount owed to the largest. Now, look at your smallest debt owed � you will start by paying $100 (your debt snowball) plus the minimum monthly payment on that debt each month, until the debt is paid off. When the debt is paid off, you will take the amount you were paying on it (let�s say $50 monthly payment plus the $100 debt snowball for a total of $150) and pay it to your next smallest debt, until it is paid off. Continue to pay off your debts, one at a time, until they are all paid off. Now you have a large sum you can put into growing your emergency fund, and funding your irregular expenses, and finally start investing. Find larger cuts. Once you�ve controlled your finances and started your debt snowball, there are ways to increase the snowball � and hence the speed with which you get out of debt. Look at your larger expenses � are there ways you can eliminate or cut back on them? Can you sell your car for a smaller, used model? Can you find a smaller house or apartment to rent? Can you sell your house and rent a cheaper one? Can you get by with one car? Can you eliminate some services you�ve been using? Whatever cuts you make, apply that amount to your debt snowball � don�t spend it. Grow your income. Another great way to get out of debt faster is to make more money. Look at ways you can make money on the side � or ask for a raise or get a better job. Take 30 minutes to brainstorm. Are there ways you can start a small business online? Sell your valuables on eBay? Start freelancing on the side? Get a part-time job? This only has to be temporary, but the more money you make, the faster you�ll get out of debt. Be sure to apply your new income to your debt snowball. Track your progress. On your debt spreadsheet, be sure to update it every payday (or however often you pay debt) so that you can see your shrinking debt amount. You should be able to calculate how many months you have left before you�re completely out of debt. It may be a long ways off, but it�s within sight! Bonus step: Celebrate! It�s important to celebrate, not only when you�re out of debt, but along the way as you eliminate each debt. Have fun! Make this an adventure. It can be amazingly satisfying to stop spending and gain control of your finances instead. Find free entertainment, make it a challenge to be frugal and save money and find cheap used stuff. Pat yourself on the back along the way. CAPTION: <?xml:namespace prefix = st1 ns = "urn:schemas-microsoft-com:office:smarttags" />SHOP TILL YOU DROP Sitcoms and comedians may poke fun at shopoholics, but for an increasing number of Americans, overshopping is no laughing matter. An estimated 17 million consumers suffer from shopping addiction, also known as oniomania --- a chronic, repetitive behavior that can destroy careers, families and finances. -- A "shop 'til you drop" behavior similar to other addictions. -- They may buy things they don't need, never use or don't remember purchasing. -- Pay by cash, check or debit card. -- Make a list and stick to it. -- Keep only one credit card for emergencies. -- "Window shop" only after stores have closed, or leave your money at home. -- Avoid catalogs and television-shopping channels. -- Take a walk or exercise when you get the urge to shop. -- If you feel out of control, seek counseling or a support group.